Martha Stewart’s New Shoe Line for Payless! Over the years, there have been countless celebrity collaborations with designers & retailers, resulting in some memorable pieces that stand the test of time, or just turn into fading trend pieces that you might remember. However, one such celebrity is entering, or re-entering, the world of fashion with a new shoe collection for Payless. Martha Stewart, designer of all things luxury living, has created Martha Everyday exclusively for the affordable footwear retailer, featuring plenty of must-have shoes perfect for the holiday season & beyond, as well as the daily work grind. 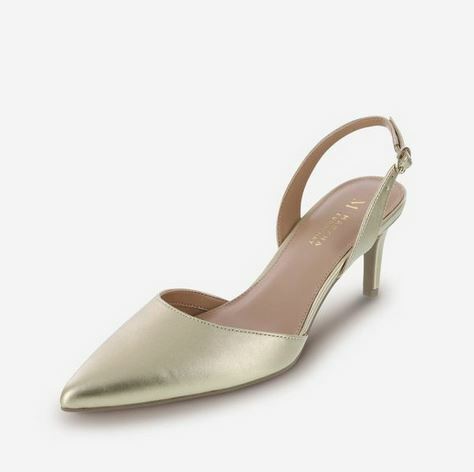 The collection includes some holiday staples, such as the Primrose ballet flats (in metallic neutrals & suede with a delicate scallop detail), Wayside mule slides, Laurels slingbacks, Haven kitten heels, & Highclere strappy sandals, as well as the new color “gilver,” which is a grey-silver combination with just enough sparkle to be easily integrated into your evening wardrobe rotation. Prices range $29.99 – $34.99, which is definitely an affordable buy (& it’s so easy to get a coupon for Payless to use on top of the great price). Which shoe is your favorite? How would you style these options? Where are you shopping for holiday shoes this season? For more shoe-related posts, click here, here, here, & here. Happy Styling! This entry was posted in Basics for a Bargain, Quickie Darling Deal & Steal, Show Me The Shoes, Style Darling Daily and tagged accessories, affordable fashion, ballet flats, Basics for a Bargain, fashion, fashionable, fashionista, flats, footwear, heels, holiday, holiday style, holidays, Martha Everyday, Martha Stewart, mules, my style, Payless, Quickie Darling Deal & Steal, sandals, shoe, shoe love, shoe lover, shoes, SHOP NOW!, Show Me The Shoes, slingbacks, style, style tip, stylish. Bookmark the permalink. ← Cover Craze: Taraji P. Henson is Boss for InStyle’s January Issue!